You recently joined a new office in the USA and are excited about your new job, new people and new place. There are many things that you might need to learn in order to survive in the country. Right from shopping to travelling and eating, you need to learn fluent English communication to converse with the people. There are many common terminologies which are not used in many countries and which are very often used in the USA. One such category is vocabulary for snacks and drinks. Today, we will teach you the vocabulary for snacks. 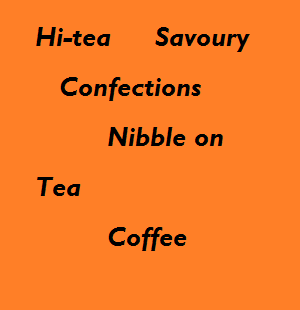 Hi-tea is generally a late afternoon or early evening meal similar to a light supper. The term was originated from Ireland. Now, the term is famous for refreshment and snacks. Hey, aren’t you coming to Zenita’s place for hi-tea? That day, we all met for a hi-tea at a coffee shop. It is another term for salted snacks. The word savoury was earlier used for snacks that could be sweet or salty. It could be a tart or small sandwich. I would have a savoury rather than a dessert. Italian cooking is best known for savoury dishes. Nibble on means to munch something small, quick bites for time being. It could be a sandwich or crackers. Let’s nibble on a sandwich from the new snacks corner. I would nibble on something before boarding the train. Confections food are the one which are rich in carbohydrates and sugar. They can be cakes and pastries, tarts and macaroons. Cake and pastry are soft sweet snacks. A tart is a baked dish consisting of a filling over a pastry base with an open top knot covered with pastry. A macaroon is a type of small circular cake which is crispy from outside and soft from inside. Café royal - When we add a teaspoon of brandy to a cup of coffee, it is called Café royal. Macchiato - When we add skim milk or low fat milk to espresso, we call it Macchiato. Herbal – Green tea and peppermint are called as herbal tea. They are generally high in caffeine and are consumed by people to be awake. Decaffeinated - A decaffeinated tea is a tea which has no or less caffeine. The above vocabulary for snacks will help you to impress others with your English communication skills. Moreover, an English speaking course is all you need to improve your spoken English and train yourself to speak like a pro. 1. How to Overcome Hesitation While Speaking English? 5. Why a housewife should learn English?